Profiles > Samantha Ettus - eGuiders. We Search. You Watch. Samantha Ettus is the host and co-creator of Obsessed TV, the premier talk show on the Internet. She is also the creator of the bestselling Experts’ Guide series of books, published by Random House, the most recent of which is The Experts’ Guide to Doing Things Faster. She penned "Celebrity Assets," a weekly syndicated column about celebrities for Scripps Howard. Previously, Samantha founded Ettus Media Management, a first-of-its-kind talent agency and marketing firm for personality-driven brands. She holds a BA and an MBA from Harvard University. The best holiday card this year comes from the always creative VC firm First Round Capital. 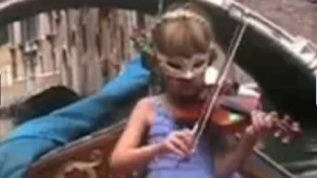 This video is a response to the uber-popular “Where the Hell is Matt” video, but more importantly, it's a video about one family’s open ended trip around the world centering on their beautiful daughter playing the violin. I just love that they are showing the world to their daughter in the most incredible way. I find the video so inspiring and eye opening, especially as a mother of two – a reality check about what is important.